Erected in 1959, the old neon sign on Las Vegas Blvd has been a landmark that has welcomed visitors to the city for decades. It’s now a tourist attraction in its own right and there’s even a small parking area in the middle of the road so you can stop for a photo. The sign is 25ft high and the “WELCOME” letters are positioned on neon circles representing silver dollars. Also, the yellow bulbs on the edge of the sign perform a “chasing” routine when lit. The sign is recognised on the US National Register of Historic Places. The sign can be very busy at times, especially if a coach party has just turned up. There’s a small mound to stand on so that someone else can take a photo without the sign being too high. Watch out for “helpful” volunteers who will offer to take a photo for you. You might think they’re other tourists, but they’re actually looking for a payment! 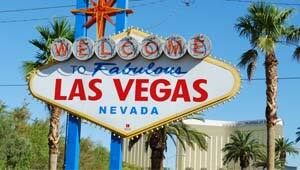 If you want to walk to the sign, it’s about 10 or 15 minutes walk beyond the Mandalay Bay Hotel & Casino. Another option for seeing the sign is to join the Las Vegas Lights Night Tour which starts at the sign with a glass of champagne before continuing down the strip.